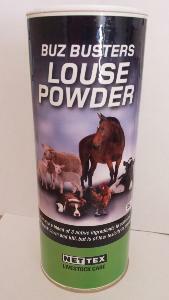 Net-tex Buz Busters Louse Powder is for amateur use and has been formulated to be especially effective against lice and fleas but will also kill most crawing and flying insects such as silver fish, beetle, ants and wasps. For use on hard porus and non-porus surfaces, soft furnishings, pet bedding, skirting boards, inside door frames, animal houses and sheds. Contains Permethrin 0.336% w/w, D-phenothrin 0.249% w/w, Pyrethrin 0.09% w/w. For use only as an insecticide. For indoor use only as a dusting powder. Do not breathe dust. Apply 30-40 grams of powder/square metre of surface. Unprotected persons and animals should be kept away from treated areas until any product residue has been removed. Do not apply directly to animals.